About 1% of people have a peanut allergy, which can vary from mild to severe. About 4 times as many people are allergic to seafood than to peanuts. Of course, SWA doesn’t serve seafood, so that’s not an issue for them. About 1 in 7 children between ages 6 and 19 are allergic to cats. Contrary to popular belief, it’s not cat fur that causes those itchy, watery eyes. Though the allergic risk is 10 times higher for pets (than peanuts) … SWA is required to “accommodate” service animals under the Americans With Disabilities Act. Much has been reported recently about folks abusing that provision (e.g. the viral clip of the “comfort” peacock being brought aboard a flight). Note: Peanuts are not provided the same rights under the law. OK, I get that SWA has no choice but to let Fido and Fluffy board the plane. 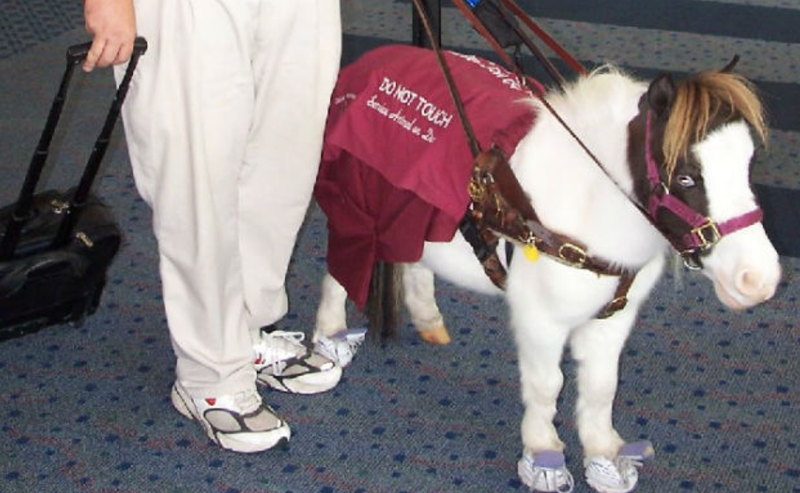 But, SWA’s recently announced policy extends the service pet policy to cover miniature horses. Suffice to say that I’d be very disappointed if a horse gets plopped down in the seat next to me. My question: Why don’t the owners just bag flying and ride the horse wherever they’re going? This entry was posted on August 27, 2018 at 6:59 am and is filed under Airlines, Allergies. You can follow any responses to this entry through the RSS 2.0 feed. You can leave a response, or trackback from your own site.